To make the simple syrup, combine the water and sugar in a small saucepan over low heat. Bring to a simmer and cook, stirring a few times, until sugar has dissolved. Remove from the heat and let cool. 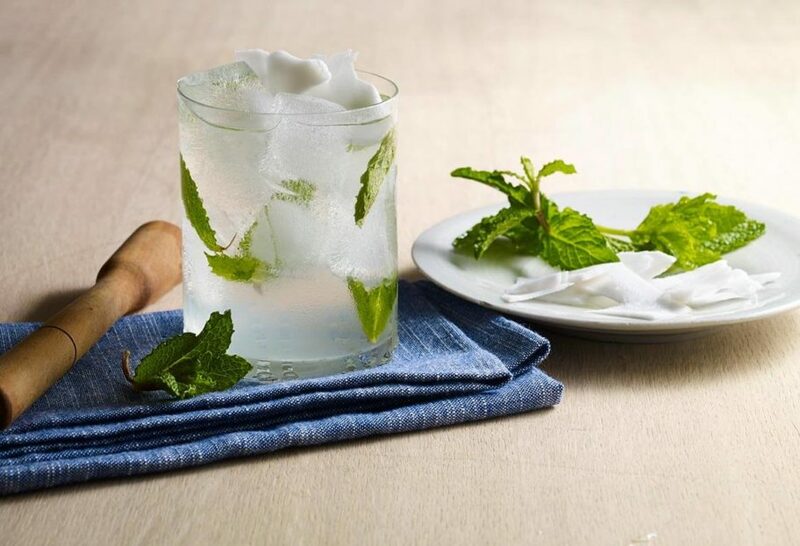 In a couple of glasses, muddle mint with the simple syrup and gin. Add ice, pour coconut water on top, stir, and garnish with the fresh and tender coconut pulp. Hi paty, Never heard of gin before, que es? It’s a type of alcohol….it’s great in this drink! I love your show Pati, especially enjoyed the one with Jose Andres. Gin & tonic is the national drink of Spain and the Coco Fish is basically a version of the gin & tonic and the entomology of the word ‘coco’ is Spanish/Portugese origin meaning grinning face from the dots on the coconut. Thank you for sharing Ed! Hola Fabiola, It’s simple syrup. To make it use 1/4 cup sugar and a 1/4 cup water and heat over low heat. Bring it to a simmer and cook, stirring it a few times, until the sugar has dissolved.